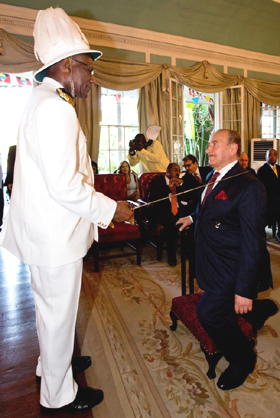 Sir Nadhmi Auchi, KCN, KSS, a member of the Charitable and the Inter faith-Religious Council of the Sacred Military Constantinian Order of St George has been knighted in recognition of the longstanding charitable and interfaith-religious work undertaken through his institutional role within the internationally recognised Roman Catholic charitable organisation. His Excellency Sir Rodney Williams, KGN, GCMG, Her Majesty’s Governor General of Antigua and Barbuda and official representative of Her Majesty Queen Elizabeth II in her right as Queen of Antigua and Barbuda, and on advice of Her Majesty’s Antigua and Barbuda Ministers, invested and presented to Sir Nadhmi the insignia of Knighthood in the rank and dignity of Knight Commander of the Most Distinguished order of the Nation (KCN). His charitable work is carried out in Europe, The Commonwealth countries and other parts of the world. 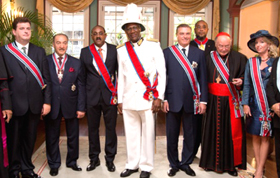 The grand ceremony at the Governor General’s Official Residence, Government House in St. John’s took place on 2nd November, 2014 to mark the official visit to Antigua and Barbuda of the Constantinian Order between 1 and 4 of November 2014. It was attended by the Prime Minister, Foreign Minister, His Royal Highness the Duke of Castro, Grand Master and His Eminence Cardinal Renato Raffaele Martino and other prominent figures. Mr Nadhmi Auchi was awarded the highest honour that the City of London can bestow, the Freedom of the City of London. In a tradition that dates back hundreds of years, a ceremony full of British pageantry was held at Stationers’ Hall to mark this occasion and was attended by leading statesmen, businessmen, ambassadors, members of Parliament and other distinguished guests. 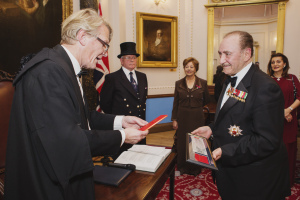 By receiving the Freedom of the City of London, Mr Auchi joins the august list of those granted this civic recognition, including Queen Elizabeth II and other members of the Royal Family, Sir Winston Churchill, Baroness Margaret Thatcher, Franklin Roosevelt, Dwight Eisenhower, Jawaharlal Nehru and Nelson Mandela, to name a few. 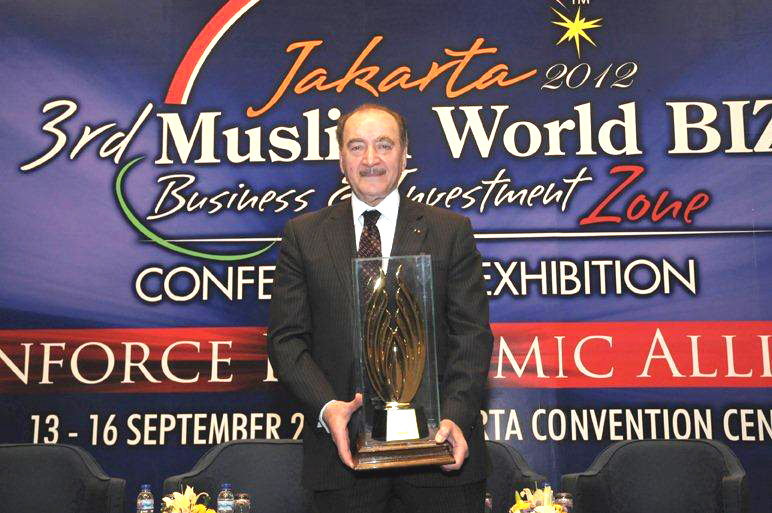 Nadhmi Auchi received the Jewels of Muslim World “Top movers of the Islamic economies” award at the 3rd Muslim world BIZ Conference and exhibition 2012 in Jakarta, Indonesia. 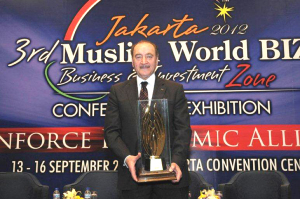 The Anglo Arab Organisation President, Mr Nadhmi Auchi, was chosen by the Voice of Asian as the best organisation in building bridges between Britain and the Arab world. The celebration took place at the British Parliament, and the award was delivered to Nadhmi Auchi by Energy Secretary, Mr Ed Davey MP. 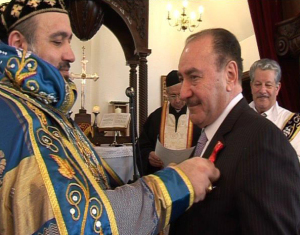 His Holiness The Patriarch of Antioch and the entire East, Supreme Head of the Universal Syriac Orthodox Church, bestowed the insignia of Commander of the St. Ephrem the Syriac Decoration to Mr Nadhmi Auchi in recognition of his charity work and schemes affected by the Nadhmi Auchi Foundation and the Anglo Arab Organisation. Mr Nadhmi Auchi was awarded an Honorary Doctorate degree in Economic Sciences by The Netherlands La Haye University in recognition of his distinct local and global achievements and leadership in the investment sector. Mr Nadhmi Auchi has received the Holy Cross Pro Ecclesia et Pontifice Medal by His Holiness Pope Benedict XVI, which was bestowed on Mr Auchi in recognition of his various inter-faith and humanitarian activities. This is the highest medal that can be awarded to the laity by the Papacy. 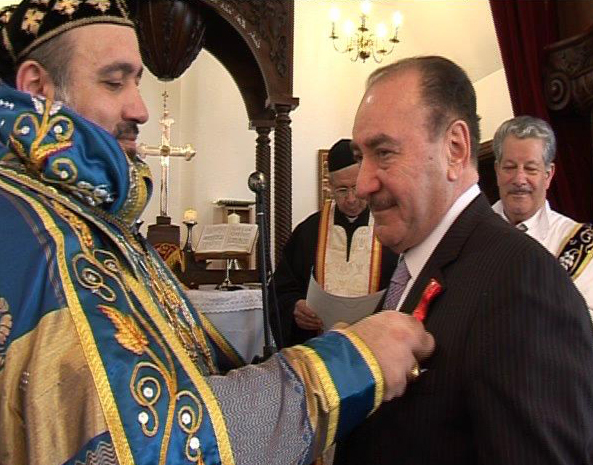 Knight of the Pontifical Order of Pope Saint Sylvester. In 2004 Mr Auchi was honoured with Knight Grand Cross of the Royal Order of Francis I in recognition of his major contributions to inter-church and inter-faith dialogue by the Sacred Military Constantin an Order of St George. On the humanitarian side, Nadhmi Auchi was more than generous in his contributions whenever and wherever needed in Darfur, Pakistan, Lebanon, Palestine or UK. In January 2007 he led through the AAO a Parliamentarian delegation from the UK to Syria & Lebanon after the Israeli attack on Lebanon meeting with Presidents Assad & Lahoud in addition to Political and Social organizations in the country to assess the enormous civilian destruction caused. Later in the year he led another Parliamentary delegation to Sudan in December 2007 to meet with President Al Bashir and the political and social organizations in the country to help ending the military conflict in the Western region of Darfur.